On Younger Season 5 Episode 3, Kelsey and Zane compete for a notable author in DC while Liza and Diana work together to make sure Pauline stays on track during her press tour. 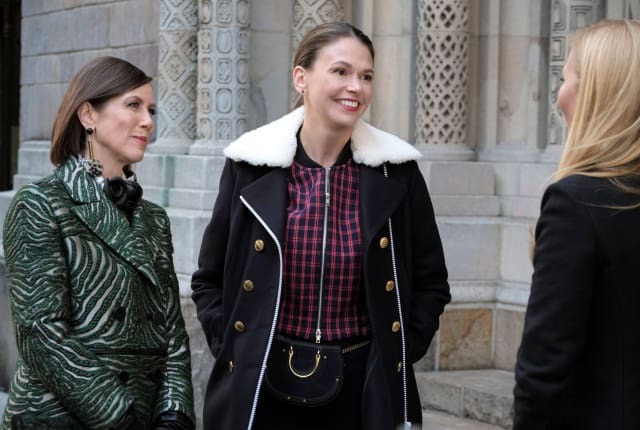 The confrontation we've all been waiting for finally happens on Younger Season 5 Episode 3! Meanwhile, Kelsey and Zane continue on their competitive streak while Josh tries to forget about his failed marriage by sleeping with many women. On Younger Season 5 Episode 3, Kelsey and Zane court a prospective memoir from a speechwriter, while Liza faces complications on the book tour. Lauren: Kelsey got onto Yara. Josh: Wow, this is like Tinder for the Illuminati, right? Permalink: Wow, this is like Tinder for the Illuminati, right? Charles: Pauline and I are getting a divorce. Diana: Oh, Charles. I am so sorry. What are we going to do about the book tour? It starts tomorrow. Charles: Everything goes forward as planned. I was never part of the publicity. Diana: Not officially. The book has been gaining momentum because people thought it resulted in the author and her husband getting back together. Charles: I don't know what to say, Diana. I'm not going to live my life to fit the novel. Permalink: I don't know what to say, Diana. I'm not going to live my life to fit the novel.